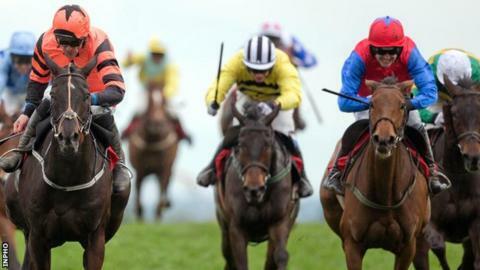 Record-breaking mare Quevega is to retire after her second at Punchestown to Jetson in the World Series Hurdle. Trainer Willie Mullins said the 10-year-old, who won at the Cheltenham Festival for the sixth time last month, would begin a breeding career. "The racing public was enraptured by the phenomenon of Quevega. "The mare didn't win any Gold Cups or Champion Hurdles, but during that five-year unbeaten period, she was simply imperious in her division. "She didn't run much - nine times during those five years - but that was it: like a rarely available film or artist or wine, her "collectors' item" appearances made her work all the more compelling. "And she did something no other horse has done - perhaps ever will do - winning at the Cheltenham Festival six times, beating the legendary 1930s record of Golden Miller." Davy Russell, riding Jetson (20-1), got a lead on his rivals and Ruby Walsh, on favourite Quevega, could not catch him. "Fair play to Jessie [trainer Harrington], she had Jetson in tip-top condition," said Russell. "He travelled and jumped very well." Fresh from winning a sixth consecutive Mares' Hurdle at Cheltenham, Quevega was the 9-10 favourite to secure a fifth victory on the bounce in the three-mile Grade One feature. She travelled with her usual zest for much of the journey, but Ruby Walsh was hard at work from the home turn. Jetson, up with the pace from outset, had already stolen a march on his rivals at the top of the straight and while Quevega did her best to reel him after the final flight, Russell's mount had enough in reserve to win. At Fishers Cross, ridden by AP McCoy, was third.